Based on the "Reverse Carnot Cycle" principle, air to water heat pumps are a type of air source heat pumps, which utilize energy from the air to generate heat and provide domestic/commercial hot water, heating and/or cooling. At the same time, air-water heating pumps are among the most efficient heat pumps on the market, since they consume the least energy to complete the above requirements. 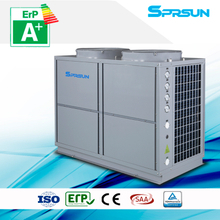 As the leading brand in China, SPRSUN can provide air to water heat pumps in several different modes: hot water; single heating; single cooling; room heating+cooling; hot water+room heating+room cooling. The hot water mode, air source heat pump water heater, is one of SPRSUN's best selling series. Air source water heaters do not need sunlight, so they can be installed indoors or outdoors. When the water stored in solar water heaters is used up, it is difficult for them to generate hot water immediately. On the contrary, as long as there is air, air source heat pump water heaters can provide hot water all-weather when air temperature is above -10℃. At the same time, they can fundamentally eliminate the problems brought by electric water heaters - electricity leakage and dry burning. Unlike gas water heaters, air to water heat pumps would not result in harmful gases or other security risks. What's more, they overcome the shortcoming of solar water heaters which cannot function satisfactorily on rainy/cloudy days. All in all, air to water heat pumps are becoming more and more popular among households and businesses with their guaranteed safety, eco-friendliness, long service life and many other advantages. The service life of an air source heat pump water heater can usually reach 15 to 20 years.